Tighter temperature control. Enhanced PIDÂ² control algorithms allow adaptive control of each zone for precise temperature control and more consistent, high-quality molded parts. Several TTC models are available for handling 12 to 256 control zones. Ease of use, worldwide. All TTC systems feature a modular design for quick control card addition and replacement. Plus, the system is easy to troubleshoot by telephone, reducing downtime and field maintenance visits. Startup is easy: just enter set points and turn the power on. Standard features such as wet heater bakeout, slaved power-up and sequenced power up go into action automatically. Plus, the new TTC family of systems is designed for global use, with expanded language conversion options, universally accepted icons, and security levels that increase or decrease operator options and complexity. Unlike most hot runner temperature controllers, the TTC system offers true global input power flexibility. So whether your operations are in the U.S. or halfway around the world, you can confidently put the best in temperature control to work. Superior reliability. Like all Gammaflux products, the new TTC systems are designed for superior reliability. One example of this is a new, optional "hot start" feature that maintains the set point in the event of a temporary loss of input power. More value. Along with a host of new features, the new TTC features a smaller footprint and an attractive price. One of the most exciting additions to the new Gammaflux TTC line of hot runner temperature control systems is the TTC 2200 Panel Mount system. For the first time, all the benefits of Gammaflux hot runner technology can be seamlessly integrated into any injection molding machine's control panel. "Due to crowded production floors molders have demanded the integration of stand-alone auxiliary equipment into the injection molding machine to save floor space," said Mike Brostedt, Gammaflux Director of Market Development. "Machine suppliers have responded by providing basic PID control loops that seldom offer more than basic thermocouple diagnostics. The TTC 2200 can now bridge the technology gap between stand-alone and integrated controls." Panel mounting the TTC 2200 eliminates the need for the typical floor-standing control cabinet. Customers will have the option of using their own machine controller for operating the TTC, or they can use the Gammaflux TTC touch-screen monitor, which can be mounted directly next to the molding machine's control panel. The TTC 2200 Panel Mount system fits into most standard cabinets, with dimensions of 32" high x 7" deep x 19" wide (813x178x482mm). 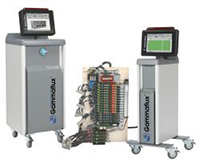 "Because all of the Gammaflux control and basic diagnostic functions are performed on the modules, the molding machine interface can communicate directly with the TTC using only basic commands," he said. "This is a very attractive option for molders, which can significantly reduce their costs by controlling tighter and diagnosing problems sooner with superior hot runner intelligence." Gammaflux engineers will work directly with the customer's machinery supplier to ensure that the TTC Panel Mount system communicates and integrates properly with the machine control interface. In addition to the family of TTC control systems on display in the Gammaflux stand at K-2001 (Hall 10, Stand 10G32), Husky Injection Molding Systems will feature a working TTC 2100-1 controlling a hot runner system in one of their molding machines. Visit the Husky stand (Hall 13, Stand 13A65) to see the TTC in action.